Wilbert Construction Inc. is a family owned and operated concrete and excavating company providing precision and quality craftsmanship on the North shore and in the Northwest suburbs of Illinois for over 34 years. Our motto is “do it right or don’t do it at all”. Our cement masons are true craftsmen. They take extreme pride in their framing and finishing skills. Senior crew members have been employed by Wilbert Construction for over 25 years. The owner of Wilbert Construction, Jerry Guill, oversees each crew and manages all aspects of every project. You will have direct contact with him from start to finish. Jerry has established, long term relationships with many architects, engineers and general contractors. Services include excavating and concrete work for residential, multi-family, commercial, municipal, park districts, country clubs and educational facilities. 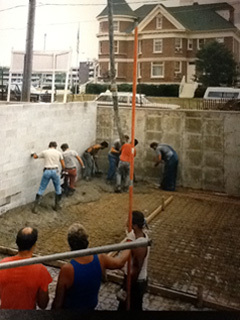 We can handle any size project from patios and driveways to foundations as deep as 30 feet. Wilbert Construction welcomes the projects other companies shy away from. Wilbert Construction also maintains its own equipment including a concrete pump, multiple size excavators, rubber tire loaders, bobcats, six-wheel and semi dump trucks. Wilbert Construction Inc. is fully licensed, bonded and insured.